kt literary » Blog Archive » “Magnificent! !” A glowing review for APOCALYPSE!! “Magnificent! !” A glowing review for APOCALYPSE!! 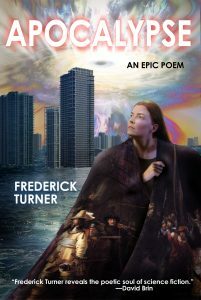 APOCALYPSE by Frederick Turner is about fighting climate change. It’s epic, it’s science fiction and…it’s written entirely in iambic pentameter. We originally pitched APOCALYPSE as Beowulf meets The Day After Tomorrow and the book is available now in ebook from Baen Books and print from Ilium Press. “Apocalypse is strange and brilliant and possibly one of the most magnificent pieces of writing I’ve yet come across…In one passage, a seemingly mundane passage about salmon becomes a beautiful tale of a journey that is ‘powered by desire, drawn by mad love’. While exploration of universal themes that have long held mankind’s thoughts, offers us gifts such as ‘Time doesn’t only happen by the push of what is past, but by the pull, the draw of some unfinished absence in the future’.